Life is tough, so are we. Thanks for your immediate reply. I've read and understood the guidelines well. guidelines are things that indicate and help determine the course of action. confusion, I believe you should compromise a bit. "Facebook技術者向けドキュメントの和訳/Tipsや、Facebook絡みのニュースを紹介しています。http://facebook-docs.oklahome.net/" and "Support making the world more open and connected." And it even says this is a community page about Facebook. 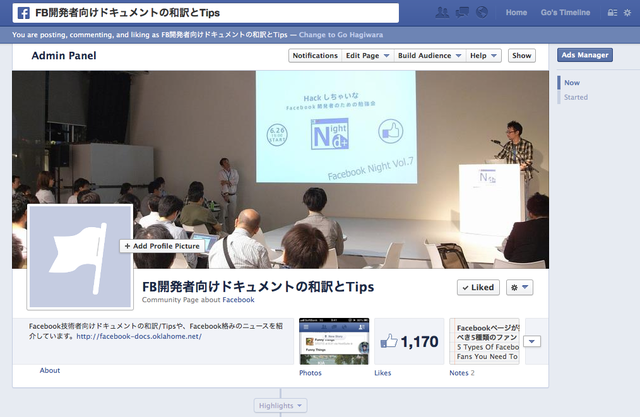 With that said, I believe, changing page title from "Oklahomer" to "FB開発者向けドキュメントの和訳とTips" is reasonable and it's more confusing and irresponsible to leave this name as it is. I trust you make a reasonable decision.